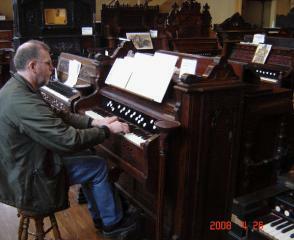 OHS Michigan members take in a mere portion of the reed organs on display at the Conklin Reed Organ museum. 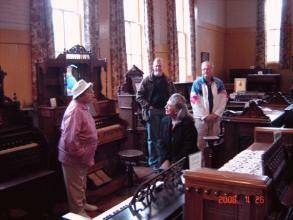 Host Frances Green Hartmann (l) provides particulars about the Organ Museum and its instruments. Brian Sweetman hunkers down a bit to fit his long legs on the pedals under the key desk. Carl Balduf takes a turn to play Who is kidding Whom? An obviously enjoyable time is had here by Terry Jankowski, MaryAnn Balduf and Brian Sweetman. 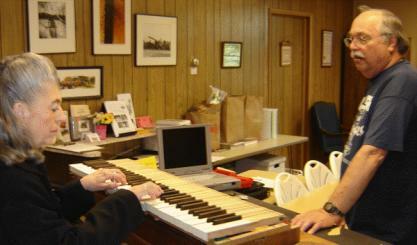 Frances Hartmann and MaryAnn Balduf examine the Mason and Hamlin reed organ that started the collection. 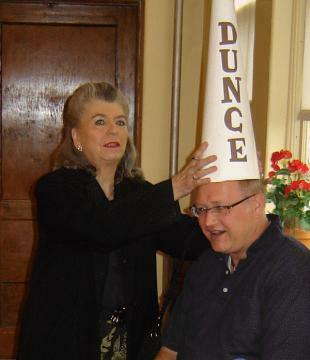 MaryAnn Balduf helps Terry Jankowski try out the dunce cap in the historic classroom at the museum. 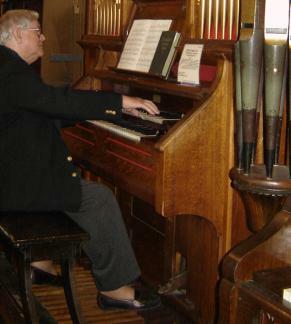 The Michigan Chapter of the Organ Historical Society held its April 2008 meeting at the Conklin Reed Organ & Historic Museum in Hanover, Michigan. 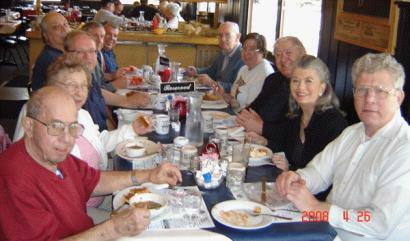 Members in attendance were Carl Balduf, MaryAnn Balduf, Terry Jankowski and Brian Sweetman. Because of the small turnout, a business meeting was not held. 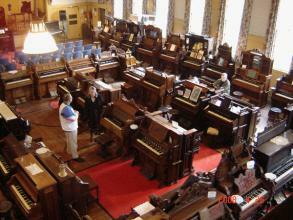 However, those in attendance thoroughly enjoyed the time spent at the museum and the outstanding collection of more than 95 fully restored and playable reed organs. 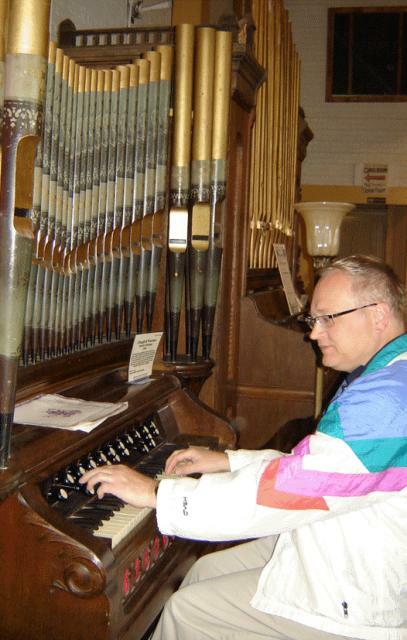 Terry Jankowski selects a new voice on this ornate reed organ. 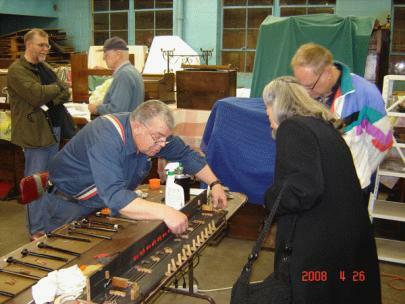 MaryAnn and Terry watch as a volunteer restorer explains a fine point in reed organ restoration. 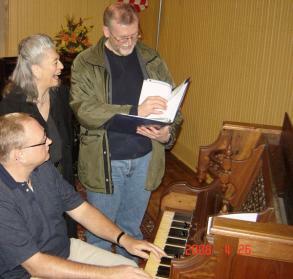 Restoration workshop volunteers listen to their handiwork as MaryAnn plays a recently restored reed organ. 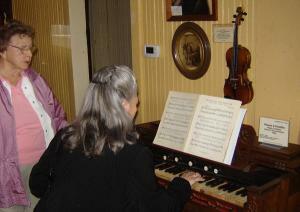 MaryAnn Balduf checks the tuning of a soon to be completed restoration. 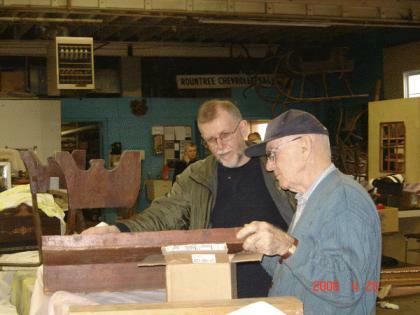 Brian Sweetman and a volunteer examine a wooden component of a restoration in progress.